Edited by: Wilfrid H.G. Haacke. 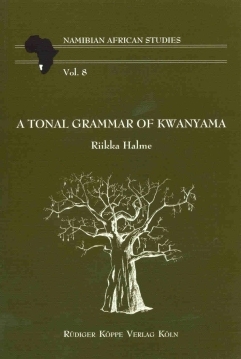 This series was published by us from volume 4 onwards and has been completed by volume 8. Author: Christa Kilian-Hatz. With supplementary material by: Matthias Brenzinger. Author: Christa Kilian-Hatz. With drawings by: Benat B. Diwana. Edited by: Wilfrid H.G. Haacke, Edward D. Elderkin. With contributions by: L.-G. Andersson, Ernst J.M. Baumbach, Patrick J. Dickens †, Eliphas Eiseb, David J. Fourie [show more…], Derek F. Gowlett, Wilfrid H.G. Haacke, Wilhelm J.G. Möhlig, Levi Namaseb, Jan Winston Snyman †, Thomas Widlok.